So it turns out that not only can you use that little VGA port on the Eee PC to display an 800 x 480 desktop on an external monitor, you can go all the way up to 1280 x 1024, and possibly beyond. Since my monitor won’t support resolutions higher than that, I can’t promise anything. 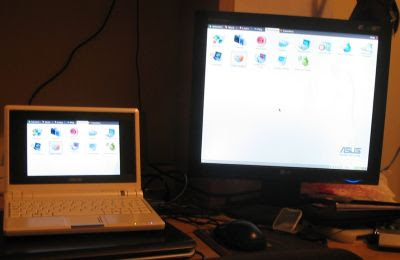 Although you could probably buy a more powerful laptop or desktop PC for $400, I’m starting to think that you really could use the Eee PC as primary computer. Just plug in a mouse, monitor, and external keyboard and you’re good to go. Oh yeah, and while support for external monitors is cool, it’s also very useful. 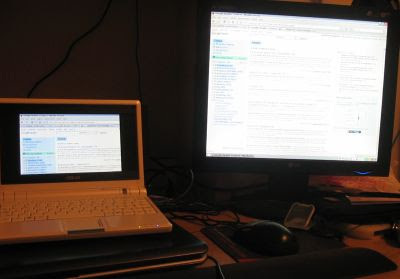 Because of the Eee PC’s cramped display, some applications just don’t fit very well. I’ve run across several programs that make it nearly impossible to edit your preferences, because several check boxes (including the “ok” or “apply” buttons) fall below the screen where you can’t access them without an external display. You can always Alt+click/drag on any window to move it into view if it’s off screen at all. Sadly, 1680 x 1050 doesn’t seem to work, it wigs out on my monitor. Can anyone advise me please! I’ve just bought an eee PC for my elderly dad because the interface is really simple for a total novice. However because its all so miniaturised I’ve had to buy mouse, keyboard and monitor. Stupidly I didn’t think to check whether Samsung make a driver for the monitor compatible with Linux as it only came with a Windows driver. I’m waiting on a response from them, but in the mean time if they can’t help, can anyone recommend a flat screen around 22″ that is going to plug and play on my eee PC? Any advice gratefully received! Have you already purchased a monitor and found out that it doesn’t work? If that’s the case, in lieu of buying another monitor, it might be cheaper to install Ubuntu, Windows XP, or another operating system on the Eee. But that eliminates the advantage of the easy to use interface that drew you to the Eee PC in the first place. You might also want to post a question over at forum.eeeuser.com where far more people will see it than in the comments section of this article. Thanks for your reply. Yes, unfortunately I have already bought the Samsung monitor. I don’t want to change the OS on the eee PC because as you rightly say, I bought it because it’s really straightforward for the novice user. If necessary I’ll buy another monitor. Can you recommend any model that will just plug and play? Many thanks. ya got a working xorg.conf? On XP I was able to get 1920×1200 using powerstrip, of an eee pc 701! I’m not kidding. 1680×1050 also works. Should also work on bsd or linux if the drivers support it and you can find the right modeline. 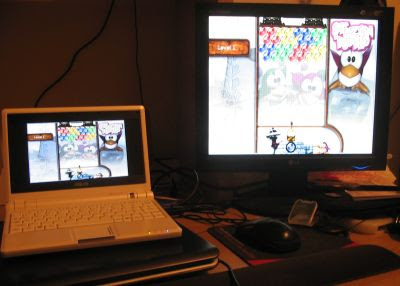 I have actually used the Eee PC as my primary computer for over a year now – and recently I got a big LCD screen to display things on. The thing can even output to 1680×1050, the screen's largest resolution, without any lag whatsoever! hi DaVince, can you tell me the brand of the LCD screen you are using with your EEEPC and whether it is compatible with Xandros? I am looking for an LCD to connect to my EEEP so I can watch telly and dvd. Sorry, I actually found out that the internal Xandros system cannot go higher than 1024×768 resolutions. This is not a graphical driver issue, but rather an OS one – the little dialog window that Eee Xandros has to switch resolutions doesn't actually detect the right ones but just uses some presets that are sure to work. I use Xubuntu, so it doesn't have that problem. http://wiki.eeeuser.com/howto:external_monitor explains how to fix this. Any external monitor should work fine, but I use a Delium LE22C9 which works just fine. Last, a nice tool to use for switching resolutions on either monitor correctly is lxrandr. Not sure how easy it is to get that application running on Xandros though. If you choose anything higher than 800 x 480, only a portion of your desktop will actually be displayed on your Eee PC. Need help. I can't get the EEE to make the external monitor the primary. Both screens display OK and I can drag to the external but when I try to select" make no.2 the main it won't do it. Any ideas? My EEE PC 900SD screen have been broken. I am connecting external monitor but the monitor does not display anything. But when i attach that monitor with my pc, its shows display. I saw this with an HDMI VGA and USB ports in the 90's. This is good documentation. I have that exact kind of eeepc, but when I plug it in, it doesn't work. How do you install it?